Yet again we are inviting you to submit your own created contracts based on this month’s theme. Inspired by Ghosts, because Ghost Mode is coming to Colombia this month, we’re setting this month’s theme as ‘GHOST BUSTERS’. However you interpret that to create your mission, is up to you. Can’t wait to see what you all come up with - Good luck! Do contracts on former Ghosts squad members count? Because I’m so going to misinterpret the theme while remaining eligible. I lack the creativity to put this theme to good use. Good luck to everyone creating their contracts! you all need to stop themed contracts thing. it limits diversity and creativity. we are seeing quailty of featured contacts is decreasing month by month, especially compared to season1. 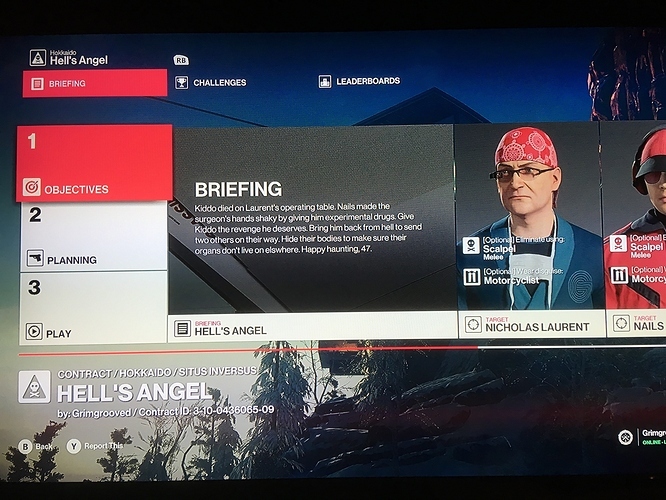 till hitman 2 has been launched, featured contract menu is totally waste! Kiddo died on Laurent’s operating table. Nails made the surgeon’s hands shaky by giving him experimental drugs. Give Kiddo the revenge he deserves. Bring him back from hell to send two others on their way. Hide their bodies to make sure their organs don’t live on elsewhere. Happy haunting, 47. In this mission, you’re not playing a ghostbuster, but a ghost, namely the ghost of the motorcyclist that died under Laurent’s shaky scalpel. The mission name is a reference to the biker gang, the Hell’s Angels. I thought it fitting because you play as a motorcyclist having come back from the dead. I came up with the “Happy haunting, 47”. The mission itself is a challenging puzzle due to the no KO and hiding bodies complications, as well as the motorcyclist suit which makes Hokkaido a hostile environment. 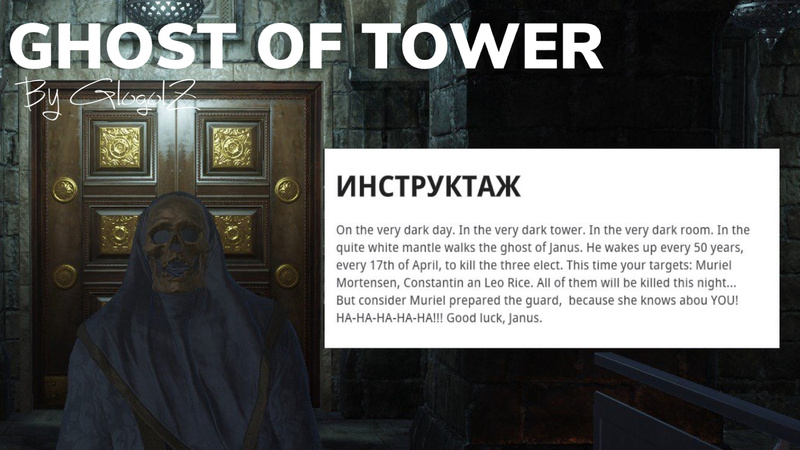 Yet it can also be completed fast and under Silent Assassin conditions. 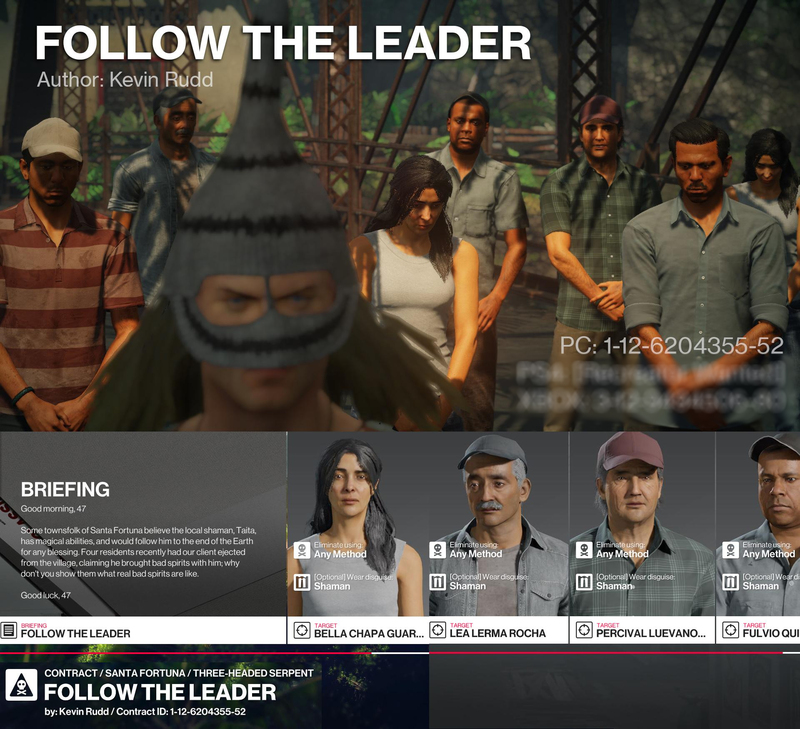 I already have a failproof walkthrough available if needed. The two targets (Nails and Dr. Laurent) are interesting characters that give more insight into a particular Hokkaido storyline. The hiding body complication is narratively explained through the facility’s business in organ transplants. There’s a lot of symbolism of revenge in this contract, which is also a reference to the “Kill Bill”-franchise, much like the name Kiddo. All complications are optional so people wanting to just get it over with won’t break a sweat. 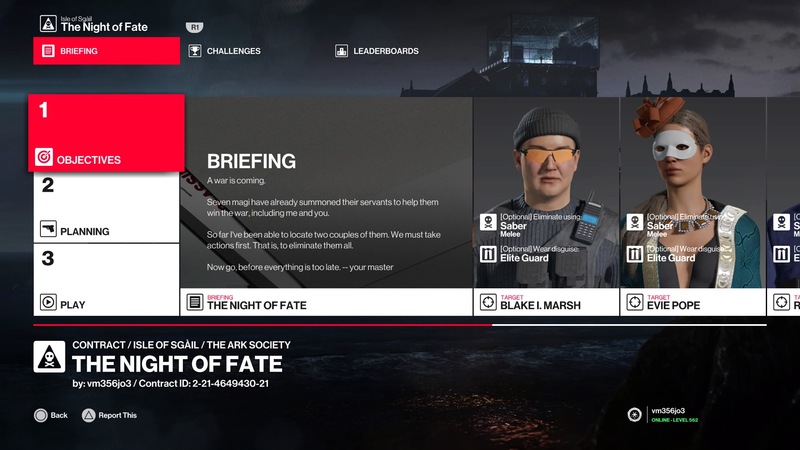 This contract is not easy. This contract has an original idea. And these are good reasons for contracts to be featured? I don’t think so. Description/Briefing This is a concept contract based on a gameplay mechanic you guys made, where the villagers of Santa Fortuna follow you around if you’re dressed as a Shaman. You have to get them to follow you… to their death! Why the contract should be featured Technically this contract is based on ‘spirits’, but spirits are basically just Latino ghosts, yeah? So I’m hoping you’ll let it slide. The client was accused of bringing bad spirits to the village and was kicked out; you’re tasked with demonstrating what real ‘bad spirits’ are capable of. Also, you guys should pin this thread so it stays near the top! I wish The Author was available for contract making. Well, I guess I’m gonna submit contract, where you are a ghost and everyone trying to stop you is a Ghost Buster. And since hitmanforum community doesn’t like instafail complications, have an old classic contract on a new map. Description: Dr. Death - serial killer, whose MO is to kill his targets with poison, while wearing disguise. and finally Brett Lampini from Aeon team. Why should it be featured: 5 targets, where each can be killed with consumed poison. On a map, where you can use either 4 syringes and 1 vial or 2 syringes and 3 vials and anything inbetween. Allows for a lot of different approaches. 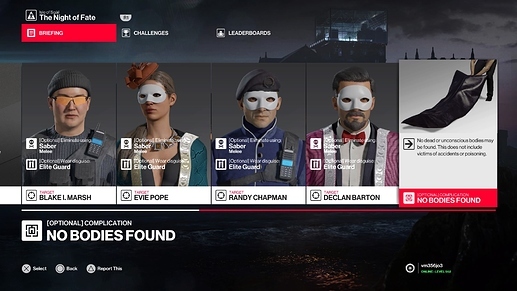 And I can vouch for being able to start using poison after getting Pale Driver disguise, without taking it off and while keeping SA rating. 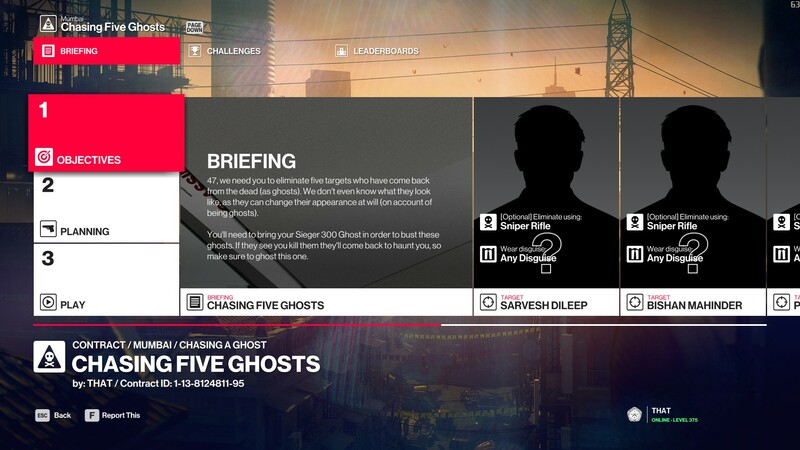 This contract is balanced, but the SA rating is more difficult, for example, the exclusive target: hacker is a difficult goal in terms of obtaining SA, but like all levels of it you can go after shooting everyone and everything. Seven Magi have already summoned their servants to help them win the war, including me and you. So for I’ve been able to locate two couple of them. We must take actions first. That is, to eliminate them all. Why the contract should be featured: This contract is inspired by a game/manga/anime series known as Fate stay night, and players are required to dress like one of the heroines: Saber (with saber as used weapon, of course). In such series, heros from the past are summoned. Since they died before, they could count as (resurrected) ghosts, I guess. Anyway, The time and atmosphere of Isle of Sgail map fits well with the theme. The contract itself is not too challenging, so players won’t likely get frustrated. I’m waiting for someone to make a contract, that requires dragging a target(/s) across whole level to kill them in very specific accident(/s) and call this “ritual” an exorcism. All the targets have random appearances (they’re ghosts), you have to kill them with a sniper rifle (such as the Sieger 300 Ghost), and you need to avoid being spotted (by ghosting the level). It’s not hard if you just use the barber opportunity (they are all killable with this method) but if you want to go fast it’s probably a lot harder. Wait. Does putting a body in hot spring water still count as drowning? It did in H2016. If so it’s basicly my last month’s featured contract, but you need to keep dragging him past garage and (after amping the temperature) into the onsen. I got your point. Perhaps when IO decide to bring back the Masamune katana, then contracts like this will become better! 47 indeed suits better in Assassin class, rather than Saber class. Wait. Does putting a body in hot spring water still count as drowning? I don’t think so since it will say ‘Melee Kill’ if you drag them into water, or knock them out while they’re standing in deep water (i.e. more than a puddle). eta: Just thought of something… In Mumbai you can drag or knock someone out in the sewer parts and they will die, but the water in the crows hideout - they will not die from this method. Just fyi.